Put 2 cups of blueberries in a skillet and add sugar and water. Heat over medium high heat, using a fork to crush some of the berries as they cook. Cook until the syrup is slightly thickened, about 5 minutes. Turn off the heat. Mix the cream cheese with 2/3 cups of the blueberry “jam” until combined. Slice the french bread in 1 1/2 inch 2 inch slices (6 large slices in one loaf of french bread- slicing off the end pieces) Score only the top of each slice of bread at the half way point. Gently pry your fingers inside the bread to make a pocket, being careful not to puncture the sides. Fill each pocket in the french bread with about 1 Tablespoon of cream cheese mixture. Close the top by pressing the edges together gently (not crushing the bread though). Beat the eggs, vanilla and milk together until well combined. Heat a non stick skillet over medium heat. Melt 2 Tablespoons of butter in the skillet. Quickly dip the french bread in the egg mixture, turning to coat the other side and place carefully in the melted butter. Turn the french toast when it is golden brown (about 2 minutes each side). I also turned it to cook the top and bottom of the french toast to give it a nice crunch. Serve with more blueberry syrup and sprinkle with powdered sugar. 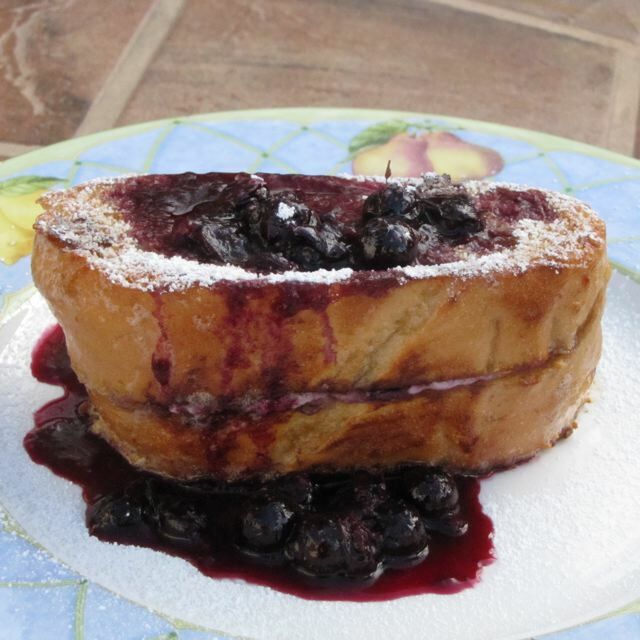 Categories: Breakfast | Tags: Blueberry French toast, Blueberry Stuffed French Toast, Stuffed French Toast | Permalink. Why is it called Sauerbraten? Sauer means sour. Braten means roast. What makes this dish unusual is the time it marinates. I let mine marinate for 3 days before preparing it. I made it to celebrate my husband’s birthday because he loves German food. I used a larger roast than the original recipe, because of the effort it takes to make the roast and because I wanted to get two meals out of it. In a large pot, combine the quartered onions, pieces of carrot and cleaned leek. Add the vinegar and water. Add Juniper berries, bay leaves, salt and pepper. Bring to a boil and then reduce heat to a simmer and simmer for 5 minutes. Turn off the heat and allow to cool to room temperature. I lined a large pot with a liner that is used for crock pots and folded the edges over the rim of the pot. I placed the roast into the bottom of the pot and poured the marinade (now at room temperature) over the roast. I tied the plastic liner shut and covered the pot with a lid (you do not have to use a liner, I wanted the keep as much as the roast covered as possible and the plastic “pulled” the liquid up and around it more than if it had just been in the pot by itself) Place the covered pot in your refrigerator. Turn the roast over once a day to allow the marinade to penetrate the roast completely. Do this for 3, 4 or even as long as 5 days. Heat a large pot over high heat and add canola oil. Brown the roast in the oil on all sides, 2-3 minutes on each side until it has a nice crust develop. Pour the reserved liquid over the roast to douse the roast and return the vegetables to the roast. Bring to a boil and reduce heat. Cover the pot with a lid and and simmer for 90 minutes or more depending on the size of the roast. My roast was closer to 5 lbs than 3, so I found it was not finished after 90 minutes and because I had used my pressure cooker pot, I removed some of the liquid to a bowl and continued using the pressure cooker for 60 minutes so it would speed the cooking process. I am unsure now if my cut of meat was the right type. In hind sight I should have used my enameled cast iron pot and had it roast in the oven for 2 hours at 400F. When the meat is done, remove it to a cutting board, remove any strings that may have been tied on by the butcher and slice the meat into thin slices. Place the meat into a baking dish and keep warm in an preheated oven (300 F). Return the liquid to the pot. Use an immersion blender to blend the vegetables into the sauce. Taste the sauce for flavor and add seasonings if you desire. I found mine to be nicely flavored. I had a lot of liquid after blending the sauce. I poured about half of it to a smaller skillet to make the gravy. I made a slurry with the 3 Tbsp of water and 2 Tbsp of cornstarch in a small bowl and added the cornstarch mixture to the gravy in the skillet and brought it to a boil and cooked until thickened. Serve the gravy over spätzle and slices of Sauerbraten. 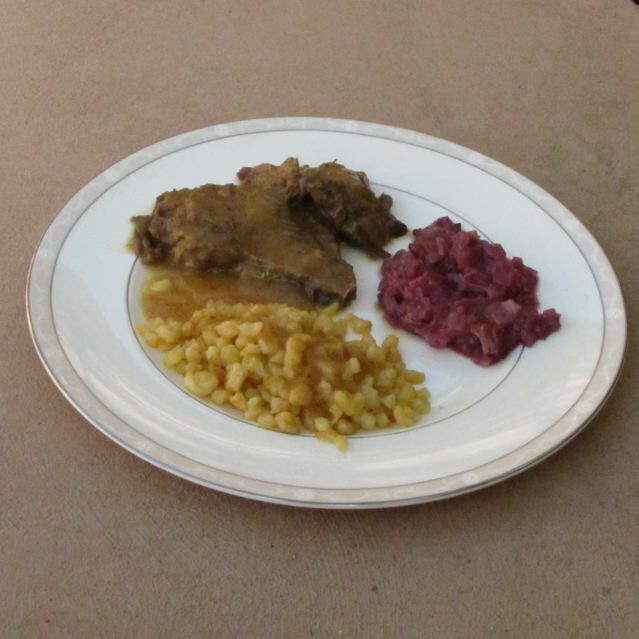 Categories: Ethnic, Ethnic - German, Main Dish - Beef | Tags: German recipe, German roast, Sauerbraten | Permalink.